Any Yowies around Bega, NSW? Has anybody every seen any traces of yowies around the Bega area? I was staying at a friend's bush acreage a little inland of Bega in 1998. In the morning I went for a walk through the bush with their cattle dog while they went shopping. As me and the dog walked along a track close to an area of thick bush, something very large started moving inside the bushy area. It was cracking sticks underfoot and moving a lot of bushes as it did so. I didn't see anything but heard it. It suddenly turned around and cringed with its tail between its legs IN FRONT of me as we scurried quickly back to the cabin. That's the first time I've seen a dog so afraid of anything its heard in the bush. It probably smelled more than heard it. I mentioned it to my friends that night. "What, you think it's a yowie?" one said. The other friend said it could have been a feral cow. She didn't want to think about a yowie living about 100 metres from her isolated cabin. Re: Any Yowies around Bega, NSW? I haven't seen anything but I have heard a witness account from just north of Bega that I probably shouldn't pass on . There is also a yowie road down that way isn't there ? Just to the north west and north east of Bega are 2 major parks that would be prime habitat and interestingly a yowie could slip between them late at night at a few points without too much difficulty . A cringing dog would be a bit of a worry and most thinking humans can tell when something isn't quite right . The best way to find them is to leave an audio recorder by itself in a suspected area , they cant help themselves and must investigate . I had my possible Yowie incident near Bega in July 2005. I was traveling down the Princes Hwy from Sydney to Melbourne, and planned to take 2-3 days. It really began to pour near Ulladulla, and just kept raining. Due to a bank error I had very little money, so even though I had camping gear in the car I decided to sleep in the car that night. It was too wet to put up a tent anyway. Got to a rest stop near a dam north of Bega, and pulled off the road about 8pm. There was nothing but bush all around for kilometres. About an hour later I was reading, when I started to get a creepy feeling like I was being watched. It was still raining cats and dogs, no-one was anywhere around... I told myself that I was crazy, being ridiculous but the feeling got stronger. I looked around in with my torch but couldn't see anything, even in the lightning flashes. This went on for about 20 mins. There were a few stick - breaking noises, but nothing that couldn't be explained by the awful weather. I was not frightened but certainly wary. Suddenly got a huge feeling of anger and hatred towards me from outside in a way I've never felt or imagined; I dislike a few people, but that was nothing compared to what I felt against me that night. It was so strong I was trying to process it, and wasn't even scared. I looked around with my torch again, and there some shadows, but nothing definitive. A minute later the fear /terror hit, and I got out of there so fast I nearly didn't make the turn onto the highway. I got to a national park car park and slept like a log until 4 am, when I left because I thought I might get bogged. No problems, no fear, nothing. 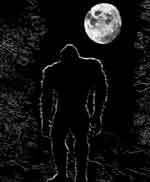 I can't say for certain it was a yowie, thought bad weather often seems to occur with sightings. I grew up in the bush, and was never ever afraid of it, and have camped in remote spots alone with no problems. I remain an avid bush walker, but am really careful where I go, and will not stay out at night now. I know for certain that there were no people there that night, but something intelligent did not want me there that night. And there were those shadows. That's the account I was thinking of Kath , I've never had it (dread) but have felt a need to leave an area immediately . Notice the bottle neck at north Bega YowieNewbie , it would be an obvious place for me to be checking . For what ever reason , these guy's would cross at that point at some time probably late at night to get to the other forest . Rusty2 wrote: That's the account I was thinking of Kath , I've never had it (dread) but have felt a need to leave an area immediately . Thanks for the discretion Rusty. It was very much appreciated. It's taken a long time for me to have the courage to post my possible encounter, just because I didn't see anything, and the sounds could have been from the weather. That said, I'm certain in my own mind; there were just too many branch snaps etc. Your not the only one Kath , do a search for dread on this site and there's many people with similar experience's . Employees at a service station (leaving Bega to head North) were very much aware of Yowies when I mentioned it to them whilst paying for petrol. I expected to be laughed at over my enquiry but instead I was received with nonchalance and the response of "Cobargo!" It was also recommended that I pay a visit to the Bega Library and search through the archives. According to them, Cobargo was the hot-spot and I was warned not to go camping up there! Older sighting at Digman's Creek near Cobargo. Also, call in at Tilba and have a chat to the guys who own the hemp clothing and jewelry shop. Sorry, can't remember the name of it. Go out to Tantawangalo, and head up the old dirt road up Brown mountain. Stop at the camp ground, and start going bush to look for signs. Very rugged and thick terrain, but if the birds go quiet, then stop and listen for what's about. If they are still down that way, that's where you will find them. I am staying out at Araluen on the river for a couple of days early April. Will be doing some night time walks and hoping to find something. Spent last week at Tantawangalo and Glenbog hunting. Only saw Deer, Wallabies and copperhead snakes. Glenbog on the other hand I did come across some "not normal" things like rocks piled up on a stump and three sticks shoved into the ground. Not sure who had done it or what. New at this and thought I was share. Whilst the immediate area around Bega has few sightings on record the region has an interesting spread. Dates only are Yowie reports whilst names are missing persons or persons found deceased. Best I could do matey. Hope its of some help?